What were the morning routines of the great composers? Take a look at the daily routines and early morning habits of history's great thinkers and creatives, in this interactive infographic. Every morning in Classic FM's More Music Breakfast, Tim Lihoreau and Yakult like to play you the best music to get your day off to a great start - we're sure you'll always find something to motivate, inspire and get you ready for the day. 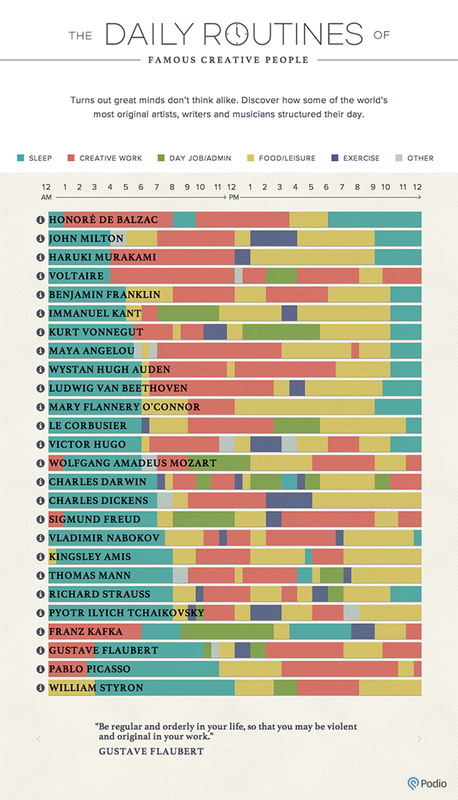 But have you ever wondered about the morning habits of history's great composers, writers and creatives? In this infographic, the website podio.com has condensed the daily routines of some of history's great minds, plotted against each other in the ultimate diary of daily genius. Take a look at the infographic below, and click on the image for a closer, interactive view. And if this inspires you to get your mind active in the early morning, Tim Lihoreau has made a few quizzes for you a bit further below.